You have a problem with your teeth. Functionally, there's nothing wrong with them — but it's another story when you look in the mirror: discoloration, wearing or maybe a slight gap between them. Fortunately, you don't have to settle for a smile you're not happy with. Less costly than crowns or bridgework, porcelain veneers can nonetheless correct many mild to moderate cosmetic problems with teeth and transform them into an attractive smile. Like the name implies, a veneer is made of thin layers of dental material custom-designed and bonded to the outside of a tooth. Veneers can correct problems with color, tooth shape and size, and mild misalignments or spacing. It's akin to installing new siding on a house. To begin your journey with veneers, we must first examine your teeth to fully assess your dental needs and ensure you have no issues that could prevent applying them. Then, we prepare your teeth: although not to the extent as for a crown or bridge, we must remove a small amount of tooth material so the veneer will appear natural and not bulky. We then make an impression mold of your prepared teeth that a dental technician will use to create your veneers. During this process they build up layer after layer of liquid porcelain until they achieve the right thickness, shape and color to match your teeth. In the meantime, we can fit you with a temporary set of veneers made of acrylic plastic so you can chew, speak and smile normally. These provisional veneers also give you and your friends and family a chance to see what your new smile will look like. When your veneers are ready, we'll create micro-etches in your teeth that will help keep the veneer secure after we've bonded them. 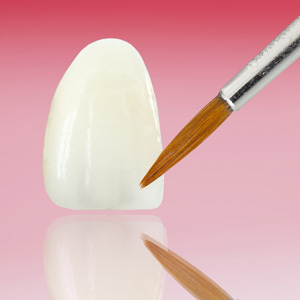 Once bonded, the veneer will feel like an inseparable part of the tooth and look it too. No one except you and us need know you're wearing veneers. If you take care of them — keeping up daily hygiene habits, not biting into hard surfaces, and visiting us regularly for checkups — your veneers can last for many years. And so will that beautiful, new smile.